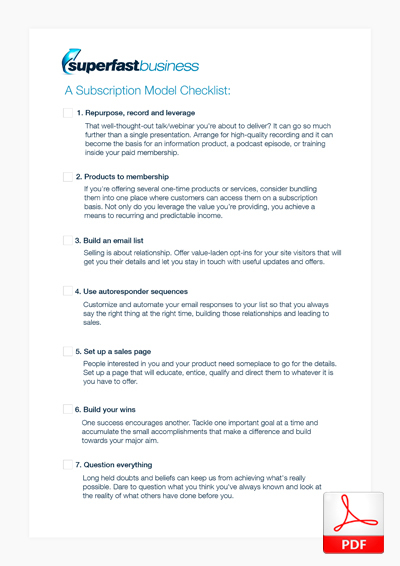 Can The Subscription Model Work For You? Russell Kempster was a police officer wanting to help others aspiring to join the force. He was offering courses online when he encountered James Schramko’s teachings, which inspired him enough to implement the subscription model in his own small business. Hear Russ’s story and find out why paid memberships aren’t just for the typical make-money enterprise online. 04:39 – These ideas are genius! James: James Schramko here. Welcome back to SuperFastBusiness.com. This is episode 562, Can the Subscription Model Work for You? And this is a case study and I’ve brought back a long-time friend, Russell Kempster. Welcome to the call. Russell: Hi James. Thanks for having me. Looking forward to chatting. James: I’ve really enjoyed catching up with you, Russ, because many years ago, you attended an event that I ran at my house, which at that time was for SilverCircle members only. And you were a business partner with another lovely fellow, and you came along to my house in a very small group setting and we talked about your business at the time and it was the first time I’d ever heard of the beep test, which is a test they use for emergency services and policemen, I think. It was really interesting to learn about that. And then recently, you purchased my book and got into contact with me, basically expressing gratitude. And when I asked why, you were telling me this amazing transformation that you’ve had in your business. And I just wanted to share this because I think, firstly, you’re in a market that is not the online money market, it’s not the crypto currency market. So that makes it actually interesting to a bunch of listeners, especially if someone’s in a market that is not the online-make-money type market or the coaching space or the crypto space and this is going to have some really relevant points. And also, I think that it’s just a great example of some of the challenges that you can go through. So firstly, I’d like to welcome you to the call, Russ, and say, if you want to check out Russ’s site, he’s got a site called primemotiontraining.com.au. But could you just tell us what you actually do at that website, Russell? Russell: Yeah. Sure. When we came to see you for that training, we were focusing very much on just one small element of what I’m actually doing now and that was focusing on helping people improve their beep test score, which is just a fitness test. But what I really do is actually help people who want to become police officers. I mentor them through the application process, help them get a competitive score so that at the end of their application they can score well enough to get to the front of the queue and then actually be offered a position in the police force that they’re applying for, because there are far more applicants applying for positions that are available. So it’s really competitive and certainly in Victoria where I’m based, if an applicant manages to get through the entire application process and pass everything, they would still need to score somewhere in the top 15 to 20 percent of all of the applicants to have any chance of actually being offered a position. So yes, that’s what I’m doing. I’m helping police applicants through the journey to give them a much better chance of actually successfully completing the application process and then being offered a position. Russell: Yeah. I just felt that the beep test was one training that I offered that we could make available electronically, whether it be a printable training program or instructional videos or whatever it might be. At the time, I was working full time as a police officer. I was just doing the fitness training on the side as a little bit of a passion, sort of hobby business and trying to figure out a way to be able to get that, particularly that beep test. I now know I was focused on the wrong thing at the time, but I just felt the beep test was the easiest way to be able to somehow place that training online and be able to get it out to more people. But look, I just didn’t really have any background in online marketing or any of the things that you were talking about at the time I first came across some of your ideas through the FreedomOcean podcast, which no doubt a lot of listeners may have as well. And some of the things I was hearing at the time, I mean now seem so simple and part of my everyday business. But I remember thinking, ‘Some of this stuff is just genius, it’s absolutely genius.’ And it led to me taking action that just changed everything and it allowed me to get into that online space and start growing the business and the income. James: So what sort of ideas seemed, like, amazing at the time, that you think are quite normal now, just out of curiosity? Russell: It’s almost a little bit embarrassing to say so, because again, it’s so standard, it’s so normal now. But I mean, just the simple things like repurposing. I mean, I was running training sessions, I was delivering really good content. But not once did I ever think to record that, to videotape it and then be able to leverage it, repurpose it. And so that, just that alone, I thought, ‘Well that’s just genius. I can take what I’ve just done and maybe turn it into a course. There were other things, like setting up a little membership site or even just a simple sales page where I could offer that course that I’d created from training that I’d already delivered. So, I was repurposing. I was able to set up that sales page, I was able to set up some automation, like payment automation, membership sort of access, adding people to email lists and then setting up a little autoresponder sequence. I mean, all of that stuff. I mean, again, it’s pretty par for the course now, but back then I just thought, this is absolutely gold. I was blown away with how clever that was and how effective it very quickly became. So yeah. Lots of basics, but at the time I was blown away. James: So, what did that mean for you as a policeman, doing a normal job and then building this thing on the side? Like, as you introduced ideas like repurposing and leveraging your recordings and putting on a membership and building an email list, like what sort of transformation happened for you at home? I mean, I loved my job. There’s absolutely no doubt that I really enjoyed the work, but of course like every job, I was exchanging my time for money and there’s a huge limit to doing it. Of course, on the side, I was doing something not intentionally to try to build some sort of big empire, or even a little part time wage, to be honest. I mean, I was just doing what I was passionate about. 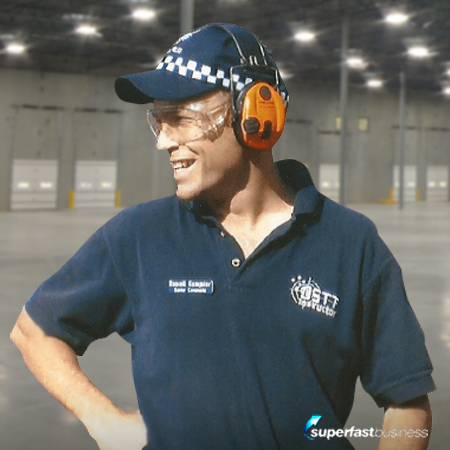 I wanted to get the training out there to more police applicants in particular and anyone else who would benefit from that beep test-related training. But look, it meant that I could extend that passion out to more people, it meant that I started to make a bit of pocket money on the side to supplement my income. And it soon became obvious that there was a really good opportunity in the online space to get my training out to more applicants and help more people than just those that were coming along to face-to-face training sessions. So yeah, it certainly opened my eyes to a completely new avenue that I could explore, which is obviously what I started to do. James: Now one thing that was really important to highlight and it’s the topic of our show, can the subscription model work for you? Initially, you had a few doubts as to how this could possibly work for you. I suppose you were thinking, well, ‘Once they’ve done a beep test, what else could I provide somebody?’ What were your reasons for thinking the subscription model may not work for you? Russell: You know, what I started to do, I mean the beep test training was the first product that I started to sort of put out there, but I very quickly realized, ‘Well, hang on, I can deliver the same sort of training for not only the fitness test part of a police applicant’s journey, but their interview stages as well. I can help them prepare for an interview. I can help them prepare for the entrance exam. And I started to sort of, I guess, spread out my coverage across all of the different stages that an applicant has to go through. And as I was doing that, I was building out these individual training courses and selling them as individual training courses. And my selection panel interview training course at the time was $295 and other courses were $100, $150 and so on. And I just thought that if I combine all these things into one membership and charge a monthly fee, I’m going to lose out big time because I can’t charge $295 per month to access this material. So, it’s going to have to be less than that and if it’s less than that, well, people are going to take that training for a month and disappear and benefit from it. But of course, it’s going to impact on my income. So, I was really reluctant to look at it, because I just felt that well, that’s not going to work for me because I sell these individual products and I’m going to make less money and customers will be around for less time and it just didn’t feel like a good fit. And strangely enough, at the time I was going through this, I mean the reason I was considering and thinking about it and questioning whether it was right for me, because that sort of seemed a real focus for you James at the time. There were three or four podcasts that you’d spoken to different subscription model guests and I remember hearing one, I think it was John Warrillow, Built to Sell author, and he said something about being half pregnant. And that’s when I said, oh well, in that case it’s definitely not for me, because I was considering, well, maybe I could offer this membership thing on the side but still keep offering my training programs and then that would be safe and I’d be covered. But yeah, it eventually got to the point where, as you often say, you really need to question your assumptions that it’s not going to work or won’t fit or it’s not right for you. And I started to question it. Yeah, and in the end, I thought, well what’s the worst thing that can happen? It just won’t work and that’s OK, I can just change it back and say yeah, I took the plunge and said, ‘All right, here we go, it’s a new model, now offering a monthly. I mean, we can talk about the positives of that, but I took the plunge and just had a look back, to be frank. James: Well, I think this is important. It’s very similar to what we’re talking about it back on episode 549 with Clint Paddison, when he went from eBooks to a membership. And this is part of the challenge, is there’s this element of uncertainty. What if I change it? But you hit on a really good point there and I think Jeff Bezos talks about this in his Amazon newsletter to shareholders, that it’s not a one-way door. If you do switch over and it doesn’t work, well then you can switch it back. There’s very few things online that are absolutely permanent and irreversible. And I’ve changed websites many times before. I’ve changed the name of my membership. So, you took the plunge. I mean, was it because I was interviewing membership experts? Was it the sense that you might be missing out on a great opportunity? It took a lot of commitment. Russell: Yeah, to be honest, I actually didn’t realize there was such a fantastic thing right under my nose. Because I was just happily building courses and supporting members as they went through that training. But of course, because I’m addicted to your material, your podcasts and so on. I mean, you were talking about that a lot. There were two or three podcasts in a row where that was the focus. And of course, I started considering then, I took on board what you were saying. But I quickly dismissed it as, it won’t fit. But that repetitive podcasts about the same issue from a slightly different angle, from each of the guests, it certainly got me to consider, well maybe I should be considering this. I mean gee, look what’s happened since I started repurposing, setting up a membership site, automating things and setting up autoresponders, all these crazy things I’d never heard of. Hey, they’ve worked really well. Well, maybe I should seriously look at that. And then again, it’s that one-liner that you say from time to time about questioning your assumptions and you talk about it in the book. And that’s exactly what I did. I’m like, ‘OK, I really need to question my assumptions here.’ And when I did, I decided to take on board what John said about the half pregnant issue and I decided, I’ve got to do it properly. I’ve got to do it fully pregnant I guess. And I did and I just have a look back, I’m certainly happy to talk about some of the positives since then. But yeah, you’re right. I mean, thinking that I can always turn it back on or turn it off and go back to where I was if it doesn’t work was probably the thing that pushed me over to actually try it. And I was nervous as hell when I actually turned the switch on the website. And literally within 10 minutes, someone had signed up to my brand-new membership. I remember leaning back in my chair going, thank God for that. Maybe it will work. And well, you know, after that things just took off. James: Right. So, you took confidence in the things that you’d already tried that had worked for you as well and you thought, hang on a minute. If the other things have worked, there’s a possibility this will work. Now a lot of things are not guaranteed or certain, especially with online, because most of the struggle, I feel, and I covered this in an entire chapter in my book, which is called Work Less Make More, available on Amazon. This whole chapter is Chapter Five, An Offer That Converts. And that’s exactly what we’re talking about here, is putting up an offer and seeing if someone will actually buy it. And you’re also switching business models, which I also covered in Chapter 8, Choosing the Right Business Model. So, what happened when you switch to the membership? Like, how did your hypothesis compare to the reality? You thought, maybe they wouldn’t stay, maybe they’re not going to be interested in a membership or the results. Russell: Well, the first thing was, and just to touch on that offer, because that’s something that was so much simpler to make and to explain than trying to explain each of the different courses for each stage in the process and because I was running live sessions and workshops and it was a little bit messy and someone who had one particular course wasn’t necessarily entitled to come to another large session or a different face-to-face training. So it was a little bit messy, but to be able to make that offer to an applicant, to say, look here are all the courses that we cover in each step of your application process and if you sign up for a member, you pay a monthly fee and you get access to all of that training. I’m here to support you whilst you’re a member. You can cancel your membership at any time. It was just so simple to explain that to people compared to the spider web that was in place prior. It was working OK anyway, but when I moved to that monthly subscription model, it was easier to explain, it was easy to put the offer out there. And as I say, within 10 minutes the first membership signup occurred and then it just kept ticking over. And I think the value was there. It was 10 times the value because they had access to everything, they still had the same level of support and they had the safety, I guess, of being able to just cancel any time and walk away and not spend another dollar. And so the numbers just climbed. I mean they just climbed and climbed and climbed. And look, I don’t mind putting my public profile out there. It’s part of attracting applicants so they can find out, ‘Hey, this guy can help me.’ Personally, I keep a pretty low profile. So I’m a little bit shy about numbers but certainly, I’d set myself a goal: within 12 months, look, it would be great to have X amount of clients. And then of course you set the ridiculous goal. It would be fantastic to have twice that many clients, if it took five years to get twice as many clients as the target I’d set in the 12-month period that would be just fine. Well, in less than 12 months I’d hit the ridiculous goal that I’d set. I’m still, to be honest, James, I’m still flabbergasted at the growth and it all came from that one moment. Of course, things lead up in time, it takes time to build up and get known and put content out there and so on. But honestly, it was like turning on a switch. Changed to the subscription model and everything just went up. Everything went up. It was fantastic and so much easier to manage and sell. It’s just, I don’t know how to put it into words but if you’re thinking about a subscription model, stop thinking and turn the switch on. James: Right. And it was so successful that it created a whole new challenge for you in terms of sorting out your personal effectiveness and leveraging things to make your membership better and adjusting things like different levels of membership. And I think you spent a year or so getting some help on those things. Do you think if you’d read Work Less Make More back then, if I’d published it earlier, that some of those chapters on personal effectiveness and business models might have helped you? Russell: Yeah, look, I’ve got to take you to task on that because convincing me to switch over to the subscription model created all these, not headaches or chaos but just, I became so busy. I mean, absolutely I’m passionate about helping people who want to become cops. But there were so many of them that they were just smothering me. And look, I thought, ‘Oh look, I need to build a team to help me with all of this stuff now.’ But I didn’t have proper systems in place. I found myself trying to train a new staff member and that just made it worse because while I was training them, I was getting bombarded with support questions that I couldn’t get back to. And certainly, reading the book over the last couple of weeks, I realized what was missing was not so much, not so much a team or even systems at that point. Because I think I’m now at that point where I need to really clarify my systems and start to slowly build my team. But at the time, it was absolutely my personal effectiveness. I was like every other person listening, no doubt. I was just glued and stuck, chained to that inbox. And for every email that came in there was a bing or a boom or a bang or some sort of notification that tapped me on the shoulder. “Hey, turn around, there’s an email.” And I’d just drop whatever I was doing and run off to the emails and I was literally stuck there. I was absolutely stuck there. So now, I’ve really thought clearly and carefully about how I need to be more effective and I love the concept of working within your energy levels. That has really resonated with me because I have so many times sat at the computer for two or three hours and achieved absolutely nothing. And I’d better go and get another coffee so I can concentrate. And now I just walk away. I’ll just walk away and refresh and do something else and switch off and then I can come back and pick up and get into it when I am feeling more energetic, I am more focused. So that itself, that working around your energy was huge. But now I’ve got a much better routine now. I do my support emails first thing in the morning, which eventually a team is going to need to take over from me, but I do my support. I close the emails and then I do a couple of little tasks that I do each morning. And then I finish them. And then I move onto, righty-oh, I need to create some content. What can I create some content about this morning? I create my content and then I switch off. And it might be two, maybe three hours since I started work and that’s when I switch off. And then I do my thing, I think about picking up the kids from school, spending that quality time. And I might pick up an hour or two later in the evening and just deal with a few more support emails. So, my structure, my personal effectiveness, my energy levels, I’m much, much more conscious about those things now and it’s made a huge difference already. I can already feel the benefit of just being conscious of those things. So, I’ll let you off the hook putting me into that situation in the first place, because you’ve given me a way to deal with it, so yeah. James: I think, if anything, I might have given you some signposts and you still went on that journey and I think what we’re really talking about here is knowing when to get extra help. You know, I think you can get so far with podcasts and a book. It’s great then when things do start turning around and you are getting some traction. That’s the best time to invest in the next stage and get more access and more personalized or customized help, which you’ve done in this situation to get you from the subscription model phase to getting things under control. And I’m very excited about talking to you about the next stage, where we look at things like annual billing, six months subscriptions and automating the sales funnel so that there’s no involvement from Russell at all in having members join up. And then the things that you can do to customize and streamline the onboarding of a membership and how you have a certain few numbers that you look at that will guide you as to the success of your membership. So these are all the sort of things we talk about inside SuperFastBusiness. What advice would you have for someone, assuming that you’ve convinced them to have a go at the membership model, what would be the essential three things that you would have to have in place to make this work? Russell: Yeah, well it’s interesting you say, because halfway through this journey I sort of came knocking on the SilverCircle door and I realized at the time it was closed, so I should’ve banged a bit harder, I think. But having read the book and sniffing around again, I see that it’s open for applications, so we might have to address that to one side. But look, three things I think: certainly, you need someone who resonates with you to follow. And I’m sure most people out there have two or three people that resonate with them and that they follow. So, find people who do resonate with you and follow them and look at the material and listen. But the second thing is, and importantly, you’ve got to implement these things. If you’re following these people for a reason, it’s because they resonate, you trust them and you like their approach, etc. But that on its own is great if you want to just listen to podcasts all day. But you’ve got to take action and implement these things. So follow someone who resonates with you, who’s been there, done that and proven themselves. Implement what they’re saying, and I guess don’t be afraid to have a go, to question those assumptions, as you say, James, question those assumptions and have a go. Like you said, it’s a two-way door. You can always turn it back on again if it doesn’t work. Yes, so follow someone who resonates with you. You’ve got to take action and actually implement those things and have a bit of courage to actually question your assumptions and just go for it. And I think I’ve done those three things, and now maybe the fourth thing is to really get serious about it and come and knock on the door I think and I’m putting my application and yeah, see if I can take it to the next level again, because I know there’s plenty of other levels to go. I’m really just focusing on the applicants in my local state in Victoria but I’ve helped plenty of other applicants from around the country, even though I’m not really putting my offer out to them with any great effort. That’s the next level for me is to scale it up again and put that offer out to those people, so I might need some help with that. James: Yeah, I can imagine that all of that intellectual property you’ve developed building your system would be super relevant for someone in another state or another country, which could be done on a partnership or a licensing scenario or you could just build it yourself. So I’ve seen a lot of my customers go from the Australasian market to the US market, which is something I did, coincidentally, because it’s much larger and we have a lot of friends over there in the US. Lots of great connections. So yeah. I think it’s really wonderful hearing your story. So are you still a policeman, Russell? Russell: I thought you might ask me that sooner. No, actually I left the police force to focus on this full-time. And of course, when I did that, well, everything took off. And not only from the business point of view but also from a time point of view. You know, our lifestyle has changed. We’ve just moved into a new house. I’ve got more time to focus on the family, a little side issue with my wife Kerry and I. We’ve got a couple of kids and one of our daughters got pretty severe disability. So, having the freedom and the flexibility with my time and some pretty good and reliable income now has made dealing with that issue a hell of a lot less stressful, a hell of a lot easier. So yeah, as I said to you the other day when I sort of reached out to say, “Hey, thanks for everything you’ve done for me,” it was because I was just having a little moment I think, about how the quality of our life has just improved out of sight. And so yeah, I left the police force doing this full time. I do miss it, because I really loved the work. I loved being in the police force. I miss it, but I’m loving life now. I’m really, really well-balanced and it’s just incredibly rewarding to help other people who want to be in the police force. It’s not a job for them, it’s a dream to become a police officer and to be able to help them achieve that is just fantastic. I’m running my last session for the year on Sunday, it’s a large session and I’m putting it on specifically for about 26 of my members who will be starting at the police academy in the first couple of months next year and they’ve been successful with their applications. So yeah, really excited for them and yeah, everything’s going well. So, happy as Larry. James: That’s fantastic, Russell. And I want to point out that you made this happen for yourself. You’ve had the same information that lots of other people have been exposed to. But the difference is you did something about it. We must take that into account, that ultimately, we are responsible for where we’re at. And if you choose to seek out information, if you choose to act upon it, then you’re choosing a different scenario than what you had before and you deserve every scrap of success that’s come your way. And it’s just so good to hear a product creator who cares about the customer and getting a result for the customer, because that’s really good-hearted stuff. And you’re an inspiration to anyone else who might be in a similar situation where they’re finding it a bit overwhelming, they’ve got a lot on their plate, they’re not exactly sure which way to go, they’ve got challenges that need to be dealt with. In a similar way to one of the reasons I got started in the first place, was when I started having kids, they just put a load on you financially and it’s a challenge to be raising kids and living in a western society. It’s not cheap and to find a way that you can serve others and get rewarded for that, a membership or some kind of subscription model is a fantastic way to go. So, thanks Russell. You can check out Russell at primemotiontraining.com.au if you want to see what he built. If you’re interested in connecting with Russell, is there a contact there, Russell? Russell: Yeah, there’s a contact form on the website or they can send something through to support@primemotiongroup.com. Yeah, come and check out the website and send in a contact form. If someone wants to connect. And just before I finish up, I agree with everything you just said then, James, but thank you so much for all of your guidance. And if it wasn’t for you, I wouldn’t have been able to take action because I didn’t have the information to act on. So, thanks so much for what you have done for me and are doing for all your listeners. Thanks very much. Cheers, man.